Sinister Swedish metal crew Marduk have announced they'll be blasting out more war-themed missives on their upcoming 13th LP, Frontschwein. The album lands in Europe on January 19 via Century Media, with a North American due date presumably set for the day after. 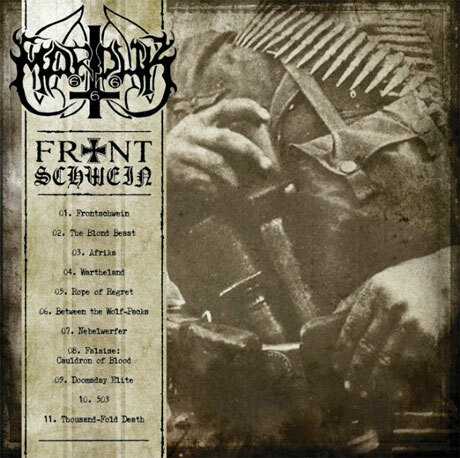 Though acting as the follow-up to 2012's Serpent Sermon, the tracklisting and cover suggest that Marduk's next set will be similar to 1999's WWII-exploring Panzer Division Marduk. As you can see up above, the cover art displays bullet vests, iron crosses and song titles like "Between the Wolf-Packs," "Wartheland," "Thousand-Fold Death" and more. Judging by the band's own Facebook page, the 11-song effort was tracked earlier this fall in Norrköping, Sweden's Endarker Studio. They also recently reported that a music video is on the way. Until the visuals arrive, you can check out the blast beat and machine gun-utilizing album track "Rope of Regret" down below. Marduk have tours of Japan, Australia and Europe lined up in early 2015. You'll find out the date details over here. Earlier this year, the band delivered deluxe reissues of 2001's La Grande Danse Macabre and 2003's World Funeral through Century Media.